Walter E. May, prominent businessman in Pikeville, KY died Friday, Nov 2 peacefully at home. May was born in 1937 on top of Peach Orchard Hill in Pikeville, Kentucky. He is pre-deceased by his father, Earl May, and mother Roberta Irick May, and a sister, Dorothy May Todd. May is survived by his children, grandchildren, and great grandchildren. Although his accomplishments were many and varied, May always thought of himself first and foremost as a broadcaster. He started working in radio as a disc jockey in 1955, and eventually moved into management and ownership. 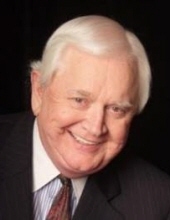 He built East Kentucky Broadcasting into a successful group of radio stations serving a large area of East Kentucky, and portions of Virginia and West Virginia. He eventually served as President of the Kentucky Broadcasters Association, and was awarded every honor the organization bestowed. The pinnacle of his broadcasting career was his election as President of the Radio Board of the National Association of Broadcasters. May served as Mayor of Pikeville from 1990-93, and served the city admirably. He especially tackled the issue of keeping the city clean and well-groomed, and was always proud of that accomplishment. Having served on the board of the Pikeville Methodist Hospital/Pikeville Medical Center since the early 1960s, May was eventually asked to fill in as CEO during a time when the facility was trying to hire a new leader. He did so as a volunteer for quite some time, until he was named President and CEO officially, a position in which he served until January of 2018. May's vision of greatness for the hospital and years of dedication steered it from a local tertiary care hospital to a regional trauma center with an affiliation with the prestigious Mayo Clinic. May was married to the mother of his children, Mona Hughes May, from 1959 to 1980. His last wife Pam Todd May from 1998 until her death May 14, 2017. He is survived by his children, Walter E. May II (Brandi), Cindy May Johnson (Randy), Melody May P’Pool and Christy May Adkins (Adrian) all of Pikeville, sister, Patty May Coleman and grandchildren Carolina Weatherford (Cory), Samantha Sargent, Jessie P’Pool, David P'Pool (Molly), Kate P’Pool, Kirsten Adkins, Christopher Adkins, Noah Adkins, Adrienne Adkins, Cameron May, Carly May and also his caregivers, Marquitta Cottle, Shelly Tackett and others. To send flowers or a remembrance gift to the family of Walter E. May, please visit our Tribute Store. "Email Address" would like to share the life celebration of Walter E. May. Click on the "link" to go to share a favorite memory or leave a condolence message for the family.